The January meeting was held at Jack Putnam's shop with 16 in attendance. We had 3 guests beside the regulars. Cookies and coffee didn't last long! Business discussed was short but mentioned were the possibilities of summer tours. Perhaps June, July, and August. One day events with an open invitation to any T owners who might want to participate. The tech session was centered on installation of a NOS cam with NOS cam bearings. Jack demonstrated align reaming of the cam bearings. This takes some special preparation. 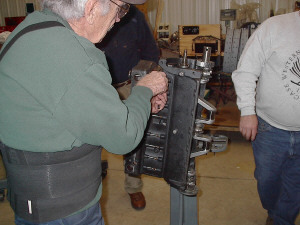 Bill Sieberg showed how to set valves uing the adjustable lifters. It is getting harder and harder to find people to do metal work. If anyone knows of a good metal worker that would be willing to fabricate body panels and fenders, please bring their name up at the next meeting. All that we seem to hear about are the ripoff artists. We need a good list of reputable auto restorers. Bill Coulman of Columbus has been working with Jack and has been spreading the news of all that can be learned by experiencing the Model T rather than just sitting back and talking about it. Take a day off of work or retirement and spend a little time working on the wonderful Model T of yours. The more that is learned about what makes it tick, the more you will enjoy and trust driving it. Everyone seems to have a good time at the meetings.. The business portion is always short, the technical portion is always informative, and the refreshments are always a hit. Here we see the guys enjoying the short meeting. Bill Mack already has an eye on the refreshments to come. Hope to see you all at the February meeting!! Bill was busy adjusting valve clearance on this engine. Since this was a New Old Stock (NOS) cam, Bill was able to turn the adjustable tappets to the correct clearances. I'd gusess that he set the intakes at .010" to .012" and the exhaust between .012" and .014". Old worn out cams need to be set by the piston method that is described in the Ford manual. Some of the hill climbers set their valves with a clearance of .025" to .030". The tradeoff is that close clearance equals quiet and wide clearance equals noisy. I'd guess that Bill is going for the quiet. Also, the flatlands of west central and northwest Ohio don't require all of that low end pulling power. If we want better low end, we buy a Ruckstell. Here we see Jack line reaming the cam bushings. The bushings can be reamed separately; but, there is no guarantee that they will be in line with each other when installed. Thecenter of the cam must be in just the right location to make the pistons fire on time. All of the adjustments to the crankshaft are made from the cam shaft. and true method of working with babbit; but, the modern method of line reaming makes the job easier and more precise. 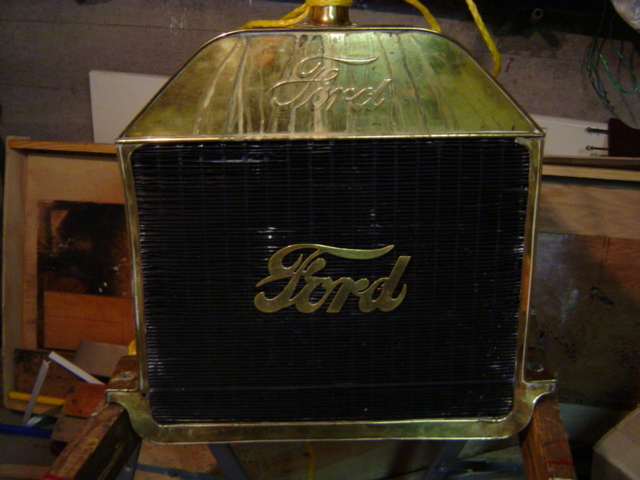 This is a radiator owned by Bruce Tolson of Roanoke, VA. He has wanted to fix this radiator for a long time; but, he's afraid to do anything about it. None of the local radiator guys will touch this repair because they didn't want to be responsible for a messed up brass radiator. The trouble all started when his father ran the 1916 touring through the front of the garage. "Dad claims that the transmission fouled up and went forward when it should have gone in reverse. We all know that Dad just stepped on the wrong pedal." The result was a slight crack in the top tank that lets steam seep out the top seam of the shell. Other than that, the radiator works fine. Anyway, Jim has been talking Bruce through the repair over the internet.